The weather outside may not be frightful, which makes Christmas in Florida so delightful. While balmy breezes and swaying palms may not be everyone's idea of a typical Christmas, Floridians have found some unique ways to celebrate the season. During the month of December, the Sunshine State is home to fun seasonal events like Santa sightings, ice sculptures, holiday parades, and even a town called Christmas. 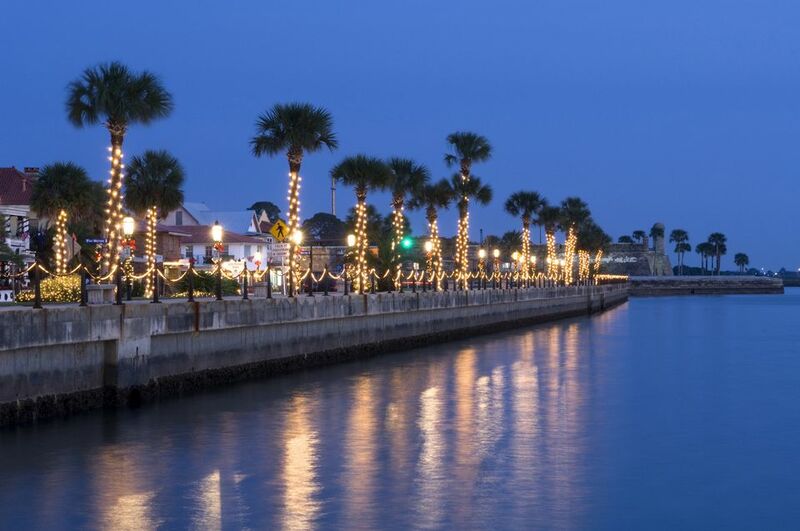 The town of St. Augustine celebrates Nights of Lights from mid-November to early February. The origins of the festival harken back to the Spanish tradition of placing a white candle on the windowsill of a home during the holiday season. The town transforms the downtown historic district by decorating every building, tree, and awning with over 3 million white lights from the bay to the town square. Bundle up, grab the kids and a camera, and make some memories. If you've ever struggled with getting your own holiday decorations in place before guests arrive, just imagine decking the halls of the 40-square-mile Walt Disney World Resort. It takes an entire year of planning, but the results are spectacular. Additional theme park celebrations include the fireworks spectacular Jingle Bell, Jingle BAM!, Holiday Cheer in Toy Land, dining with Minnie Mouse, and the transformation of the outside of the Tower of Terror into a laser projection storytelling canvas. Find Santa in Walt Disney World holding court along Sunset Blvd. in Disney's Hollywood Studios until Christmas Eve. This holiday attraction is hand-carved from nearly two million pounds of ice that create a winter experience like no other in Florida. The popular family experience gives guests a chance to visit a whimsical winter wonderland of interactive environments and larger-than-life, three-dimensional ice monuments and sculptures. The enormous structure used to house Gaylord Palms' ICE! (dubbed "The Florida Fridge") is cooled to a chilly 9 degrees making it necessary for the resort to provide over-sized winter coats for visitors to wear. Festive decorations and sounds of the season highlight LEGOLAND Florida's Christmas Bricktacular celebration. Children get a meet and greet with LEGO Santa, can help create a giant Christmas mosaic, and enjoy a 30-foot tall LEGO Christmas tree, as well as send letters to the North Pole. The Holly Jolly Jubilee stage show features a chorus of singing and dancing elves. A very different take on celebrating the Feast of Seven Fishes happens at sunny Florida's SeaWorld Orlando through the end of December. Holiday guests can meet-and-greet Santa and Rudolph the Red-Nosed Reindeer, plus enjoy seasonal performance shows like O Wonderous Night, a retelling of the nativity story featuring a cast of life-size puppets and live animals. If you didn't get to New York for Macy's Thanksgiving Parade, there is no need to pout. Each evening during December, all of the floats, performers, costumes, and marching bands that make up the Macy's tradition will fill the streets of Universal Studios Orlando. Islands of Adventure celebrates with Grinchmas, featuring the green one himself and the Whos. In addition, specially themed holiday shows feature live music and entertainment like a holiday theme at The Wizarding World of Harry Potter. Epcot's Candlelight Processional is one of the most popular holiday traditions at Disney World. The grand musical performance comes from a mass choir and a full orchestra, but the real treat of the evening is when a celebrity narrator retells the traditional Christmas story. Daily performances run from late November through the end of December at America Gardens Theatre. Yes, Virginia, there really is a Christmas, Florida, so there must be a Santa Claus. Florida may not see much snow, but the small post office near historical Fort Christmas sees plenty of activity before the holiday. People come from miles around to have their Christmas cards postmarked "Christmas, Florida". If you go, expect to wait in longer-than-usual lines for what has become a holiday tradition for many. Christmas, Florida is located about 20 miles east of Orlando on Highway 50. The historical park and museum are located a few miles north of Highway 50 at 1300 Fort Christmas Road (C.R. 420). It isn't hard to believe that after Santa spends much of the year at the North Pole that he would enjoy the warmer climate of Florida. Florida East Coast Railroad's annual Christmas Trains to the North Pole departs in early December and makes a series of stops where Ol' Kris Kringle greets children. Every day until the first week of January is a fair day at Santa's Enchanted Forest in Miami. We're talking midway games and rides, attractions, themed displays, a 92-foot Christmas tree, over three million twinkling holiday lights, and all the fun Santa and his elves can create.